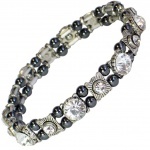 Hematite is a mineral form of iron oxide with some very unusual magnetic properties. 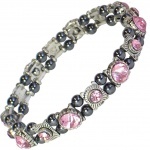 It became popular for use in jewellery in the Victorian era, but it was not until the 1950s that it's remarkable magnetic properties were thoroughly researched. 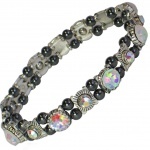 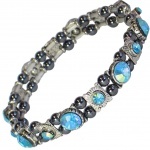 We offer a range of bright, colourful Hematite bracelets with coloured crystal beads and powerful (3500 Gauss) magnets.